The Vietnamese Government has accused Australia of "causing serious damage" to its prawn farmers and exporters and has asked the Federal Government to reconsider the ban on uncooked prawn imports. Federal Agriculture Minister Barnaby Joyce announced a six-month suspension on the import of raw prawns in January, following an outbreak of white spot disease in Queensland. Vietnam’s Deputy Minister of Industry and Trade Tran Quoc Khanh said the ban had damaged his country’s aquaculture industry, which exports about USD 55 million worth of uncooked prawns to Australia. "In our view, [the ban] is not in line with common practices and the spirit of nurturing and enhancing the existing good trade relationship between Vietnam and Australia," Khanh said. "The temporary ban on uncooked prawns was issued by the Australian Government without giving sufficient time, by advance warning, for Vietnamese prawn exporters to take needed actions to avoid such large economic losses. "The prawn import suspension imposed by the Australian Government has been causing serious damage to the prawn farmers and exporters in Vietnam. "A number of Vietnamese exporters specializing in the Australian market are facing the risk of going bankrupt due to the suspension." Australian authorities are still investigating how white spot disease spread to Australia, while prawn farmers have blamed Asian imports. 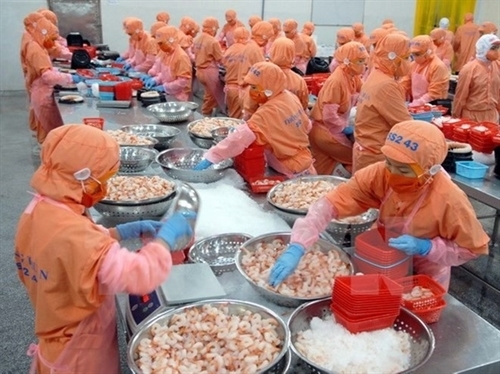 Khanh said Vietnam should be allowed to keep exporting raw prawns to Australia until there is proof that imported prawns were the source of the outbreak. "If Australia continues to maintain the ban, Vietnam requests that it provide adequate scientific evidence as soon as possible showing a causal relationship between prawn imports from Vietnam and the outbreak of white spot disease in Australia," he added. Vietnam’s Government said the ban may be in breach of a World Trade Organization agreement on how governments should apply food safety measures to traded products. "Some Vietnamese businesses view the suspension as going beyond the necessary extent provided for in the WTO agreement, but we are still studying this point of view of Vietnamese companies," he said. The Seafood Importers Association of Australia has previously said the ban had damaged Australia’s international trade reputation, but the Department of Agriculture defended the move, saying it was necessary to protect the nation’s aquaculture industry. The deputy minister said he respected Australia’s sovereignty and biosecurity decisions, but nonetheless asked the Federal Government to reconsider the need for a ban. "We are supportive of the actions taken by the Australian Government in applying necessary measures to control the outbreak," he said. "This does not imply that we push aside the safety of the Australian prawn farming industry. "We call for the close cooperation by the two sides in taking alternative measures that have less negative impacts on our bilateral trade, while ensuring the safety of the Australian prawn farming industry and the environment in Australia." He said Vietnamese uncooked prawn products had been exported to many countries around the world without facing any import suspension. "We are willing to support the Australian Government’s decision on prawn import suspension but only when other measures which have less negative impacts on trade have proved to be ineffective or useless," he said. Vietnam and Australia have disagreed over bilateral agricultural trade before. In 2015, Vietnam temporarily banned the importation of fruits from Australia following a disagreement over Mediterranean fruit fly. An increase in exotic pets and diseases has prompted Australian farmers and environmentalists to demand more focus on biosecurity. An Australian Agriculture Department spokesperson said the government and the department had "the utmost respect for domestic farming industries in Vietnam and across the globe". "Our work to support technical market access in countries that Australia exports to, as well as those that we import from, is firmly based on the safety and biosecurity of local industries both in Australia and overseas, as well as the mutual economic benefits of trade," the spokesperson said. "The department recognizes that this suspension will have flow-on effects to Australian consumers and international exporters, including Vietnam. The decision is not one that has been taken lightly." The spokesperson said the suspension complied with the provisions of WTO agreements that allow a member to temporarily suspend imports in certain circumstances.